Specifically, “Taliban” refers to Muslim students who attend a traditional madrassa, which is a school where Islamic studies comprise most of the curriculum (although, historically, other subjects including architecture, astronomy, and philosophy also were taught). Madrassas initially were established in the early centuries after the death of the Muslim prophet Muhammad in order to preserve religious conformity through the uniform teaching of Islam. As the armies of Islam conquered vast territories whose inhabitants were neither Arab nor Muslim, but rather Buddhist, Christian, Hindu, Jewish, and Persian Zoroastrian, the need to standardize the new belief system that was forcing its tenets at the point of the sword on such diverse communities gave rise to the institution of the madrassa. There, subjects like fiqh (Islamic jurisprudence), the Sunna (acts and sayings of Muhammad, or hadith, and his biography, or Sira), and Tafsir (learned Qur’anic commentary) were taught in various levels of complexity. Such schools typically are attached to an Islamic Center or mosque. More basic Islamic schools, that mostly focus on rote pronunciation and memorization of Qur’anic verses (often in the complete absence of any comprehension of Arabic), also sprang up to meet the lower-level needs of young students in the village setting. More recently in the 20th century, the word madrassa has come to be associated almost exclusively with these Qur’anic study schools that often attract poor boys who otherwise would get little or no formal education. Fast forward to the lawless years after the 1989 withdrawal of the Soviet Army from Afghanistan, when Mujahedeen warlords, backed variously by the Pakistani Inter-Services Intelligence (ISI) Directorate and Interior Ministry, devastated whatever was left of a country laid waste by the bloody decade of fighting the Russians. Accurately analyzing the desperation felt by many Afghans and well-aware of the indoctrinating role played by Pakistani madrassas (many associated with the jihadist Deobandi movement and funded by Saudi Arabia), some Pakistani generals hit on the idea of turning to the thousands of poor Afghan madrassa students for a ready source of puritanical fanaticism that could be formed into a potent army, easily managed and zealous to cleanse their homeland of its corrupt and warring factions. This is how the modern-day conglomeration of groups known as the Afghan Taliban emerged in the early years of the 1990s. Afghans, weary of blood and privation and attracted by the Taliban’s pious image, flocked to their support and soon, they were unstoppable. By the time Taliban forces captured Kabul in September 1996 and the world was just beginning to realize that a dangerous new force was filling the power vacuum in Afghanistan, it was too late. Osama bin Laden and Ayman al-Zawahiri returned to Afghanistan in that year after several years of safehaven in Sudan, where they had forged ominous alliances with Iran and Hizballah and established the foundations of what would soon become al-Qa’eda. Warlords like Mullah Omar, the top Taliban commander, and Gulbuddin Hekmatyar, whom bin Laden and al-Zawahiri knew from the 1980s, were now controlling the government in Kabul and readily welcomed them back to Afghanistan. Under the protection of Mullah Omar, bin Laden and al-Qa’eda were free to operationalize their relationship with the Iranian Islamic Revolutionary Guards Corps (IRGC) and intelligence service (MOIS-Ministry of Intelligence and Security). As the Taliban focused on terrorizing the Afghan people, al-Qa’eda, Iran, and Hizballah launched a succession of terror attacks of their own (Khobar Towers, East Africa Embassies, USS Cole), punctuated by two public declarations of war, in 1996 and 1998, which were largely ignored, or at least misunderstood, by the U.S. national security leadership. Islamic doctrine obligates Muslim jihadis to issue a warning, a call to Islam (Da’wa), before a military attack and this is exactly what Osama bin Laden, his al-Qa’eda deputy Ayman al-Zawahiri, and others did. Their Islamic faith, reasoning, and philosophy were all spelled out in great detail in essays, letters, proclamations, and other writing; to no avail, though, as the West refused to understand then (as now) that Islamic doctrine, law, and scripture command the faithful to jihad. The result of that failure, of that “willful blindness,” as the brilliant former Department of Justice prosecutor Andrew McCarthy calls it, was 9/11. Now as the U.S. enters the 2012 election year, one of the top priorities of the Obama administration appears to be completing the full withdrawal of American troops from Afghanistan. Reporting indicates that State Department envoys actually have been in secret talks with Mullah Omar about the terms of that retreat for as much as a year already. Under consideration, according to those reports, are the opening of a Taliban political office in Doha, Qatar, and the possible release from detention at Guantanamo Bay of a number of top Taliban officials. Additionally, some reports (described as “not accurate” but also not denied by the White House) have suggested that the U.S. has been availing itself of the mediation services of Yousef al-Qaradawi, the venomously anti-American, antisemitic ideological leader and spiritual guide of the Muslim Brotherhood, in those discussions with the Taliban. Challenges abound before the U.S. can complete its Afghanistan withdrawal, not least of which are objections from the Afghan president Hamid Karzai (our ostensible ally) about those secret talks the U.S. has been holding with the Taliban. The Taliban and its al-Qa’eda and Iranian regime allies already have achieved some major victories, though, among which one of the most critical was manipulating the U.S. government into supporting the drafting of an Afghan constitution that subjugates the country to Islamic law (shariah). That is, the Afghan constitution that the U.S. State Department helped write stipulates the death penalty for adultery, apostasy, blasphemy/slander, and homosexuality; amputation, flogging, and stoning as criminal penalties; and the forcible repression of women and girls. Once strictly enforced, it is exactly what the Taliban (and al-Qa’eda) want for Afghanistan. As departing American troops begin to relinquish control to their Afghan government counterparts of territory wrested from Taliban control, Taliban warlords, coffers full from the opium trade and assured of safehaven just across the Pakistan border whenever they need it, once again are carving out districts where shariah is the only law. 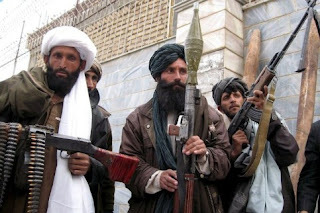 With the impending full withdrawal of U.S. and other Western troops from Afghanistan, the Taliban eventually will achieve another of its key goals, which is the removal of all kuffar (infidel) forces from Afghan Muslim soil. The ultimate re-establishment of the Islamic Emirate of Afghanistan under Taliban control is now within reach and so is the possibility that al-Qa’eda and Iranian jihadis once again will find there an amenable host under whose protection new terror plots against the American homeland and global allies may be hatched. After all, as Vice President Joe Biden announced in December 2011, “the Taliban…is not our enemy….” And he has a point: the Afghan Taliban (unlike its Pakistani counterpart, the Tarek-e Taliban Pakistan) has never been placed on the official U.S. government list of Foreign Terrorist Organizations. So, despite their support for al-Qa’eda both before and after the 9/11 attacks, atrocious human rights record, rock solid commitment to the violent imposition of shariah Islam, and the thousands of Afghan, U.S., and coalition troops injured and killed by Taliban jihadis, they still get a pass…because the erstwhile leader of the free world has decided Afghanistan’s just not worth it and wants out. The U.S. intelligence community is warning that the Taliban have abandoned none of their goals to conquer all of Afghanistan and enforce strict Islamic law (shariah). A new National Intelligence Estimate (NIE), which represents the collective judgment of the most senior U.S. intelligence analysts, warned the White House in December 2011 that the Taliban would settle for nothing less than total control over “an Islamic emirate.” Nevertheless, the Obama administration acknowledges that its envoys have been pursuing talks with the Taliban for the past year, are working on the opening of a political office for the Taliban in Doha, Qatar, and are considering the release of several Taliban detainees from Guantanamo Bay—as a “trust-building measure.” What could possibly go wrong? Aside from the fact that Afghan President Hamid Karzai seems somehow to have been left out of this flurry of diplomatic activity with the Islamic jihadists who have been fighting for the better part of two decades to take over his country, the continuing failure of U.S. leadership to know the enemy cripples our ability to defend America’s most critical national security needs and exposes the homeland to the very real possibility of another 9/11. The December 2011 NIE on the Afghan Taliban plainly stated that Mullah Mohammad Omar, the Pashtun warlord whose government sheltered Usama bin Laden and al-Qa’eda in the 1990s, remains totally committed to taking over all of Afghanistan and subjugating it to the harsh dictates of shariah. When the Taliban ruled The Islamic Emirate of Afghanistan from 1996 until they were ousted by U.S. forces in late 2001, the world saw the most barbaric cruelties of Islamic law inflicted on the Afghan people: amputation, flogging, and stoning, as well as the savage repression of women and girls. As became obvious on one clear day in September 2001, it wasn’t the Afghan people alone who would suffer at the hands of the Taliban. Mullah Omar’s Afghanistan harbored Usama bin Laden, Ayman al-Zawahiri, and the rest of al-Qa’eda as they plotted the attacks of September 11 together with the Iranian regime. As we now know from the December 2011 ruling in the Havlish case by Judge George Daniels of the Southern District of New York, the top levels of the Iranian regime, and specifically the Islamic Revolutionary Guard Corps (IRGC) and intelligence service (MOIS—Ministry of Intelligence and Security), were closely involved in providing “direct and material support” to al-Qa’eda in the 9/11 attacks—and it was Mullah Omar whose steadfast loyalty to Usama bin Laden and secret dealings with Iran allowed those attack plans to proceed. This is the same Mullah Omar with whom Department of State envoy Marc Grossman has been meeting for months, unbeknownst to the American people and unbeknownst to the thousands of American troops who are still fighting against the Taliban, dying, and coming home maimed for life, in a valiant effort to defeat the forces of shariah Islam. Unfortunately, most Americans and most of our service members probably don’t know that the Department of State long ago helped write the Afghan constitution, which placed the country firmly under Islamic law, complete with dictates that apostasy is punishable by death, blasphemy/slander against Islam is a capital crime, minority faiths such as Buddhism and Christianity face institutional discrimination, women are officially second-class citizens, and freedom of speech and expression is non-existent. This means that, for the last decade or so, thousands of Americans and other NATO coalition forces have been fighting to defend a government in Kabul that was already subjugated to shariah (one of the key objectives of al-Qa’eda and the Taliban in the first place). Late December 2011 and early January 2012 reporting indicates that the situation may yet become even worse. There are indications that the U.S. government is considering the release of several senior Taliban leaders who have been held at Guantanamo Bay for years and have until now been considered too dangerous to let go. Now, however, in a desperate effort to complete the American withdrawal from Afghanistan and entice Mullah Omar’s Taliban jihadis into negotiations, the White House is thinking of setting free some of the worst of the worst Taliban terror leadership—including at least one figure who personally arranged and attended a pre-9/11 planning meeting with Hizballah, Iranian, and Taliban officials. Khirullah Said Wali Khairkhwa is a former Governor of Herat Province, Afghanistan who served under Mullah Omar’s Taliban government from 1999-2001. Khairkhwa met in Kandahar directly with Usama bin Laden and other jihadi fighters at least once in early 2000 and also after 9/11 at a clandestine October 2001 meeting between senior Iranian intelligence and Taliban officials at which Iran pledged to assist the Taliban in its war against the United States. Indeed, according to the Havlish case documents, Khairkhwa had been appointed Governor of Herat Province in western Afghanistan with the explicit mission to improve relations between Iran and the Taliban. Guantanamo Bay Combatant Status Review Board transcripts show that he fulfilled that tasking by bringing senior Taliban leaders such as Hizbi-I Islami commander Gulbuddin Hekmatyar together with Usama bin Laden and Hekmatyar associates in the Iranian IRGC and MOIS. Khairkhwa was captured in 2002 and transferred to Guantanamo Bay; significantly, Washington, D.C. District Court Judge Ricardo Urbina denied Khairkhwa's petition for a writ of habeas corpus in an opinion issued in May 2011. Now, the U.S. government is considering releasing Khairkhwa anyway and perhaps several other senior Taliban figures as well, all of whom were closely associated with al-Qa’eda and all of whom the U.S. military has assessed as posing a high risk of returning to Taliban ranks to continue fighting jihad if let out. This would be in return for nothing from the Taliban except some promises to continue talking. Khairkhwa’s close relationship with the Iranian IRGC and intelligence service only compounds the danger of allowing him out of U.S. custody. And yet, that is exactly what reportedly is now under serious consideration by the U.S. government. With Afghanistan under Islamic law, U.S. and allied Western troops soon to withdraw, and now possibly the Taliban’s top jihadis to be released from American detention, it would be a clean sweep total victory for the forces of shariah Islam. Minus Usama bin Laden and some other former top leaders now gone from the scene, but bolstered by the incredible wholesale collapse of Western resolve, al-Qa’eda and the Taliban, together with jihadist allies in Iran and Pakistan, would be free once again to consolidate their hold over Afghanistan. As Iran continues to drive towards a deliverable nuclear weapons capability and with Pakistan already in possession of a nuclear arsenal, the forces of shariah Islam clearly are ascendant across multiple fronts. Prospects for stability in West Asia look increasingly dim. Prospects for American leadership in defense of genuine democracy and freedom look even worse. Clare M. Lopez, a senior fellow at the Clarion Fund, writes regularly for RadicalIslam.org, and is a strategic policy and intelligence expert with a focus on Middle East, national defense, and counterterrorism issues. Terror Training Camps Inside U.S.